Amanda's Quick Bite for Healthy Living: Almost 3! Ava is such a big girl these days! We're starting to plan her third birthday party in March. She's so excited to have a birthday party coming up and she likes to talk about who will come to celebrate with her. She wants all of her friends and teachers from school to be there. I'm planning to do a bird theme party. Here's a look of some of the fun things that Ava is up to these days. For Christmas, her Berkey grandparents got her a pink tricycle. We keep it in the basement in our spare room. It's really funny because she disappears for a bit to play with toys in there and then all the sudden you'll hear the little bell and she comes out. 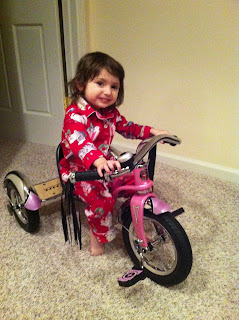 She usually pushes it with her feet on the ground instead of using the peddles. We'll put it outside in the Spring when the weather is warmer. On New Year's Eve, Aaron had to work because it was the end of the quarter. I had the week off from work and I was excited to take Ava to visit Daddy for lunch. 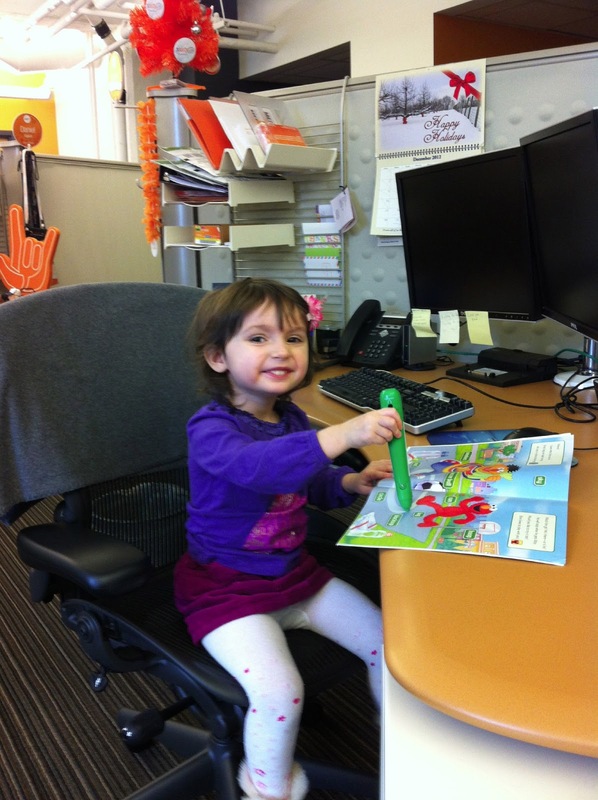 I had to finish my final expense report before the end of the year so I brought her up to my desk first. She enjoyed playing with her book while I was busy at the computer. Then we met Aaron for lunch! Aaron and I both work at the same company and even in the same building! He just recently moved to another building a couple blocks away, but it was fun when we were in the same building. Ava got to meet our coworkers and she was very friendly that day. We had fun! She's excited to visit Daddy for lunch again soon! Ava is really into watching Diego, even more than Dora! We have Amazon Prime and we can get free streaming movies on the computer. We limit her TV time so it's a big treat! She knows how to work the iPad and iPhones, of course! When she's on my laptop watching Diego, she tries to push bottons on the screen because she thinks it's a touch screen. We just got her a kids table, which is in the kitchen now. She really likes having her own size furniture to have a snack, do art projects, or play with her baby dolls. She often moves the two chairs so they're side by side so she can sit next to her baby, which is really sweet. For my January Freezer Meal Exchange, I made homemade brownies. Ava is really into chocolate! She was so excited to taste the batter, which she never does with when we're baking. Then after we got the brownies in the oven she asked me to help her wash the dirty dishes. 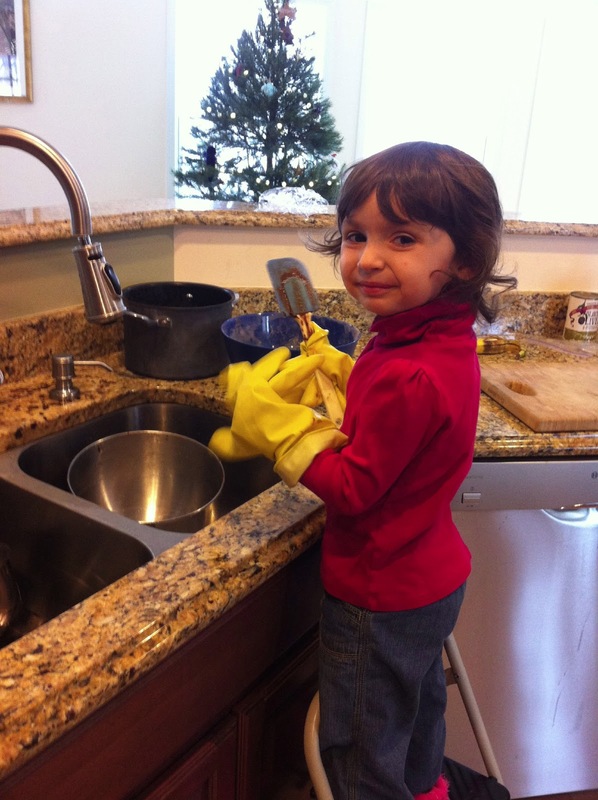 She pushed the step stool to the sink and put on my gloves. It was so cute! It's so surreal that Ava is about to turn 3 years old. People ask us if we're planning to have more children. We're not sure which way we'll go. Aaron takes the possibility of adding to our family very seriously when it comes to more responsibility where I see more about the emotional side of having another person to love. It's hard to say what will happen in the future, but we're really enjoying this moment in time with our little family! That Ava is such a DOLL!! Love hearing what she is up to these days. She really resembles you in the picture where she is washing dishes. I usually think she favors Aaron, but maybe she is starting to show more Mommy traits as she matures! I have to say, Baby #2 is really a pleasure. We feel so much more relaxed and confident as parents this time around. Not that it isn't still a big change, but I think going from one child to two is not as shocking as becoming a parent for the first time around.